"I don’t design clothes, I design dreams"
Imagine Fashion Designer 3D shies away from simulating the job to presenting a facsimile of it, gamifying the act of compiling outfit combinations and their superficial design. It’s certainly not a deep and involving game of nuanced mechanics and choices as you try to climb the fashion guru ladder; to the title's benefit it's a far more relaxed affair. As a lowly fashion designer wannabe you must fulfil the fashion desires of a selection of clients from the world of fashion, music, TV and film on the road to worldwide designer fame. As your designs dazzle and you please more and more clients, your popularity and prestige grows until your creations are in the highest demand, and the actual act of becoming a style god couldn’t be simpler. After tapping away on My Career in the main menu a comprehensive tutorial takes you through each step: choosing a client, meeting their expectations, putting your outfit together and seeing the finished product as you client struts her stuff at a party, film première or other high profile event. It’s a linear set of actions that feels hugely accessible but detrimentally simple. On choosing a client you're given six hints to how to create the outfit your client truly desires. However, these hints act more like a checklist of criteria than subtle clues and so take minimal effort to design your client’s perfect outfit and achieve full marks. With your checklist always to hand it’s a matter of combining clothes and accessories from a steadily expanding carousel of pieces to match the criteria. Clothing is separated into eight categories, and often you’re required to stick within these themes, adding accessories such as sunglasses and jewellery to a certain budget, after which you can customise each piece. The customisation is where the real meat of the game lies. All clothing can be tarted-up with patterns and colours, and as with the rest of the title, it’s a very easy system to use. Patterns and decals can be picked from a side bar and their size and orientation adjusted with sliders and with your stylus on-screen, with colour control too. 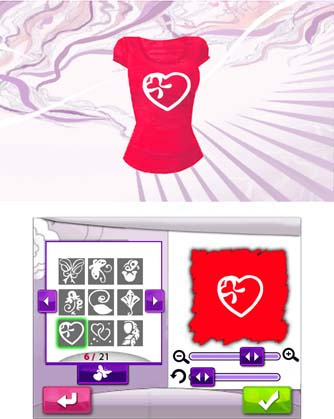 However, the most unique aspect is through the use of the 3DS camera, where you can capture photos of your own patterns and decals to add to your creations. It’s an expansive set of customisation options out of the box, but when you start capturing your own through the camera it becomes truly vast. With your outfit ready for its début, your client wears it to their function and the fashion paparazzi analyse and report on your creation. However, with the checklist providing such overwhelming aid you’ll find yourself swiftly climbing the ranks of fashion designer stardom as you easily complete your client’s challenges, or at least you would if progress wasn’t stunted through persistent money troubles. Completing challenges for clients is for fame, not money — in order to fund your creativity you need to sell your past outfits and complete mini-games. After creating your first couple of outfits you’ll have no choice but to leave your campaign and delve into the mini games and My Style Studio options to raise enough cash to continue. It’s an intrusive way of lengthening the overall experience. 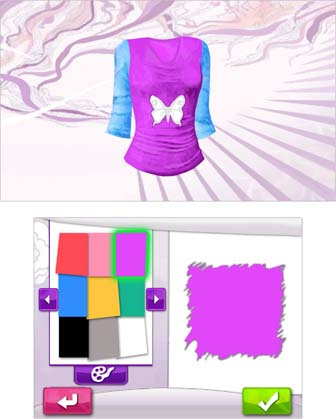 In My Style Studio you're free to buy items of clothing to create outfits that you then sell on for a profit. Meanwhile the mini games section holds three fundamentally simple challenges that test your memory and ability to identify styles. 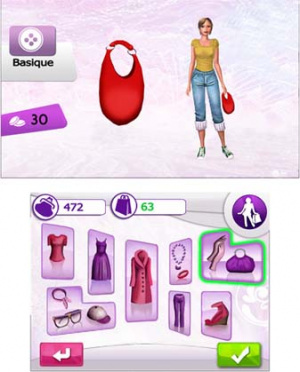 They might be simplistic but they can prove surprisingly difficult: on a technical level the size of each piece of clothing can make it hard to determine what it is, let alone its style, and the fashionably-challenged will find both style mini games tough. To round out the package a multiplayer mode sets two players against each other in a fashion-off as players try to out-design the other on client challenges. Additionally you can trade designs with other players and StreetPass offers up gifts of more clothing if you pass other player on the street. In the end, Imagine Fashion Designer 3D is a competent and hugely accessible treat for the wannabe preteen fashion designer who can forgive the interruptions to the campaign, but it'll prove too simplistic and shallow for those who want to spread their creative wings. Anna wintour doesn't! approve for the gouge September issue. les see how many people get the joke. Dear god, it got a 5/10? I know its still January, but best fashion game of 2012? Wow, even though thats not a good score I'm still surprised it got a score that high. I know right? 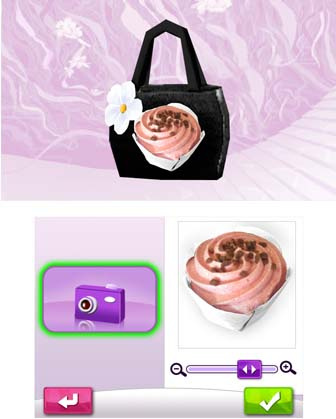 This looked to be very intuitive and it seemed to be able to fit my fashion designer needs. Ah well. Would this be suitable for a five year old who is just beginning to read? I know the age rating is 3 but I often find that my daughter needs constant help with the vast amount of text in a lot of these types of games or does it have a voice over? She would love this. So, for those who like these types of games, I'm guessing it'd be better to wait for that sequel for that DS game called Girls Mode? Aaaaaaannnnndddd ... it just got out of fashion right now. I'd say the new Style Savvy game should be much more charming but i don't know if for the target audience it's an option to wait for that game. I feel sorry for Greg Giddens that he pulled the short straw and had to review this. I hope you got something out of this. Like at least a cookie. Why do people just churn these steaming piles of you-know-what (aside from profit)? HAHAHA! If there is a target audience, the reviewer certainly was not one of them. He only used the word 'like' once! 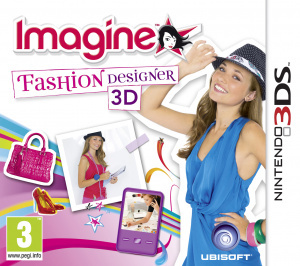 Waste of good development time to make a fashion game. There are so many untapped ideas in fishing games still to be explored. Pop Cutie! Street Fashion Simulation — very quirky, cutely Japanese (in a good way), that my daughter must have played thru at least half a dozen times. Hmm imma buy this game ! I'll just wait for the Style Savvy sequel.